Painter, graphic designer and poster artist, sculptor. Author of architectural projects and urban space projects, set designer. Born on 15th November 1922 in Warsaw. Died on 25th October 2015. Painter, author of architectural projects and urban space projects. Fangor's interest in art wasn't hindered by the outbreak of World War II. He studied privately with Tadeusz Pruszkowski and Felicjan Szczęsny Kowarski (1940-44) and in 1946 he received a diploma in absentia at the Academy of Fine Arts in Warsaw where he was assistant professor between 1953 and 1961. In the absurdity of post-war Poland, Fangor took the expressionist and impressionist styles of the French masters early on in his career. When in 1949 the authorities instated realism as the only legitimate form of art, Fangor began painting his signature 'characters' of contemporary Polish society. His transition from impressionism and abstraction into realism was relatively smooth, his work rather different from the typical image of Socio-realism of the time. Exploring colour, space and their manifold relationships as his fundamental means of expression, the artist evolved a unique visual language reflecting his artistic interests, discoveries and innovations. His very personal approach to form and the manner in which it was intended to affect viewers resembled much more closely the three-dimensional perception of sculptors or architects, than that of painters with their emphasis on the two-dimensional and the mimetic. Over the years he began expanding his oeuvre to create installations, such as the 1958 Study of Space exhibition at the New Culture Salon in Warsaw, and architectural projects, such as the renovation of the interior of the restaurant at the capital's horseracing track, the design of the Central Department Store in Warsaw, the Polish Pavilion at the World Exhibition in Brussels and the interiors of the Central Train Station (Śródmieście) in Warsaw. In 1951, he was awarded second prize at the II National Exhibition of Fine Arts in Warsaw for his paintings Lenin in Poronin and Korean Mother. 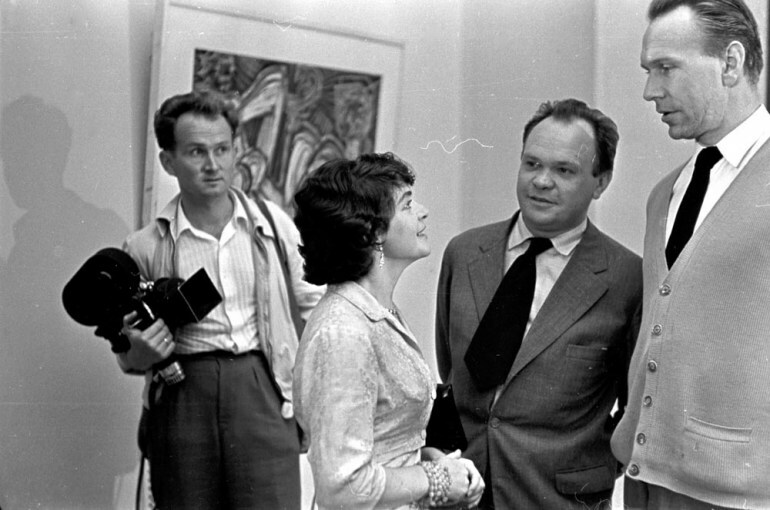 In 1957, he participated in the II Exhibition of Modern Art organized at the Zachęta National Gallery of Art in Warsaw, where he exhibited A Composition of Space, created together with Oskar Hansen and Stanisław Zamecznik. In 1958, together with Stanisław Zamecznik, he created an exhibition entitled 'A Study of Space' in the New Culture Salon in Warsaw (it was the first artistic 'environment' ever created in Poland). He received scholarships from the Institute for Contemporary Art in Washington, DC (1962) and the Ford Foundation in West Berlin (1964-65). In 1965-66, he taught at the Bath Academy of Art in Corsham, Wiltshire, England, and from 1966-83, he led classes at Farleigh Dickinson University in Madison, N.J. in the United States. In 1967-68, he conducted guest lectures at the Faculty of Architecture at the Graduate School of Design, Harvard University, Cambridge, Massachusetts. In 1970, he created sets for the Martha Graham Dance Company. In 1978, he received the Alfred Jurzykowski Foundation Award, and in 2003, he was awarded The Minister of Culture of the Republic of Poland Award. Immediately after the war, Wojciech Fangor created paintings that belong to the canon of socialist realist works of art, later co-founding the Polish School of Poster Art. In the period 1953-61, he designed about 100 posters and created numerous drawings for the Życie Warszawy daily. In his paintings, as well as in his poster art, he used similar artistic motifs, monumental and powerful forms that were synthetic and simplified. Sometimes the social realism subjects in his work took on elements of caricature (Figures, 1950). At the beginning of the '50s, he started to work with architects such as Stanislaw Zamecznik, Oskar Hansen, Zbigniew Ichnatowicz and Jerzy Sołtan. Stanisław Zamecznik instilled in Fangor an awareness of space as an artistic material. Together they created an exhibition entitled "A Study of Space" (1958) which was an innovative artistic 'environment' composed of twenty 'optical' paintings by Fangor. These paintings, as the artist himself says, resulted from an accidental discovery. Fangor wanted to paint two-dimensional pictures, i.e. where figurative marks were to be imposed on a background of unspecified forms of diffuse contours (faces, hands, etc.). After painting the background, the artist discovered that it had a strange effect on the space in front of the image; it changed and activated the space. An illusion of space was created, developing the image toward the viewer. The artist decided not to include the figurative elements, and later called his discovery a 'positive illusory space'. 'A Study of Space' consisted of 20 canvases of various formats. Only four of them hung on the walls, the rest were set on easels. The exhibition was not about individual paintings but about the relationships between them. By choosing a path between the paintings, the viewer became the co-author of a work that was not a closed structure, but an open system. 'A Study of Space' was ahead of its time, a classic environment with all the properties that this type of art was to develop in the future. In addition to 'A Study of Space', Fangor and Zamecznik created two more exhibitions devoted to space: both in 1959, at the Stedelijk Museum and in front of the Zachęta National Gallery of Art in Warsaw. Bzik Kulturalny: Wojciech Fangor [English subtitles] from Culture.pl on Vimeo. In 1966 the artist immigrated to the United States. He became a leading representative of the up-and-coming Op-art movement. In his work he focused on issues of color and light. Showing light, its spectrum, the chromatic effects of its separation became Fangor's primary aim in his paintings. He produced canvasses composed of colored circles and waves. With pulsating, vibrating contours, his forms generated an impression of movement and various optical illusions. The artist exhibited at some of the world's most famous and prestigious galleries and museums and lectured at a number of notable American universities and colleges. He was the first Polish artist to have a solo show dedicated to his works at the Guggenheim Museum in New York. After several years travelling around Europe, Fangor settled in the United States. In 1970, he had a solo exhibition, the first Polish artist to have done so, at New York's Solomon Guggenheim Museum. There he showed 37 paintings, precursors to the western explorations of op-art. In the mid-'70s, the artist returned to figurative painting (interior space studies, the work of 'Picture in Picture'). He also created a series of paintings based on television images, which used visual effects typical of this medium. In his 'television' paintings Fangor recreated the images from the TV screen in the form of an indiscriminate mass of colour; a little like posters, and then he broke the image using small dots imitating electronic pixels, thereby generating a pointillistic quivering texture. Since the mid-'80s, Fangor has created paintings including fragments of scenes, characters and objects, which were often quotes from other images known from art history or repainted from illustrated magazines. When considering the incredibly diverse works of this artist, one can not fail to notice that Fangor has never stopped thinking about space, treating it either as an area of physical sensations, or metaphorically.